From time to time, the Century Cycles staff helps around the community by providing presentations to local youth groups about bicycling safety and basic maintenance. 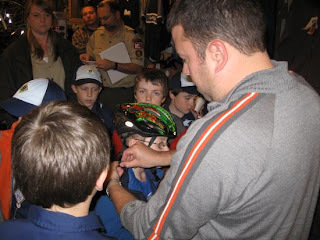 Sometimes, these talks help local scouting groups earn their Bicycling Merit Badges. 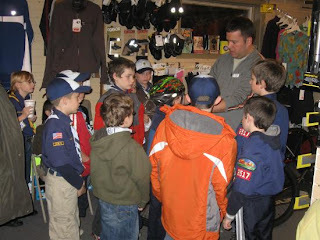 The latest such event was hosted by Doug at the Peninsula store for two Cub Scout dens from the Brunswick area, this past Monday, November 16. This sounds incredibly cool! Is this an open program? What an awesome experience for a young scout and an excellent way to serve the scouting community! I think that many more cub scout dens in the Cleveland area would be interested in this program. I hope you do this again. This has not been an official or formal "program" of ours per se. It's mainly been driven by local troop leaders in our area calling us up and asking if we can do it, and people like Doug being generous enough with their time and effort to put it together on their own. If you or someone you know in the scout organization are interested, just give us a call, and we will try to work something out if we can fit it into our schedule.